There are now various bills filed in both the House of Representatives and the Senate proposing the reduction of taxes being imposed on incomes of Filipinos belonging to middle class of our society. The discussions in this blog post refers to the article by Sen. Sonny Angara, author of Senate Bill No. 2149, explaining his proposed reduction on the tax to be imposed on individual income earners. 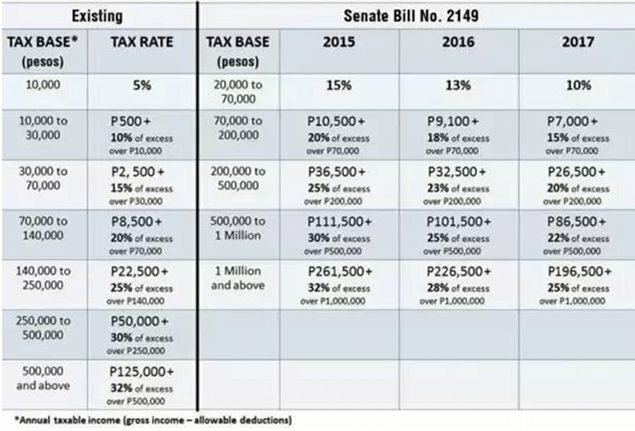 His presentation is complete with a table (see below) of the current tax rate versus the proposed rates for the various level of income but the discussion centered mainly on overtaxed working middle class especially those earning above ₱500-M annually. It looks as if those in the lower income group are not being burdened by the current taxation scheme. From the above table of income taxes due, it is clearly shown that the low income earners will be taxed more in 2015 and 2016 if the proposed bill by Sen. Angara will be approved as-is and implemented next year. I cannot understand the reason why this group has to be taxed more except if they will say that the increase on the tax of the poor people will be to compensate for the loss of tax revenues due to reduction in the percentage tax of the middle class. What a sad note indeed!